★MULTIPLE COMPARTMENTS-5 Spacious Pockets, 2 Regular Set Pockets Measuring 8" To Keep Bulky Products, 2 Side Pockets Measuring 12" To Keep Larger Items, One Aluminum foil refrigerator compartment with zippers Measuring 7.5" are specially designed for frozen food storage, Great for unplanned cold or frozen items from grocery store. ★HEAT PRESERVATION-Car organizer has a temperature-insulated compartment in middle, so you can keep stuff like food and drinks warm or cool according to your different needs. ★FOLDABLE AND CONVENIENT TO CARRY-When not in use, just fold up and use the handy adjustable claps to keep it neat and tidy,it likes a hand bag,easy to carry and save the space. 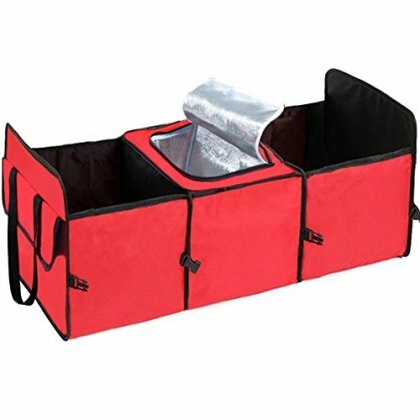 ★DURABLE CONSTRUCTION-Big Ant's Car Trunk Organizer made of Oxford Polyester Fabric, so it is durable and strong.Sturdy construction and collapsible design allows use as a garage organizer or cargo box for cars. ★KEEP THE TRUNK NEAT AND TIDY-You've got plenty of room to store sports gear and groceries organized,anything that you would want to transport in your vehicle ,like maps, emergency gear and groceries ,and keep the trunk of your vehicle neat and tidy.